Power tools can be very dangerous, which is why it's so important to know how to use them properly. The most important thing to remember is that workers need to be trained to use each tool that their job requires. This training should also include safe working procedures, potential hazards, and wearing the right safety supplies such as hard hats, safety glasses, work gloves, and work boots. One of the most common mistakes that people make with power tools involves their power cords. Tools should never be carried by the cord. It puts too much strain on the connection point, increasing the possibility of a malfunction. When disconnecting the cord from an outlet, the power tool should be turned off and the plug should be firmly grasped and pulled from the outlet. Plugs should never be removed from an outlet by yanking on the cord. Power tools should be turned off and disconnected from their power source whenever they're not in use. Pneumatic tools are powered by a compressor that supplies compressed air. The greatest danger of pneumatic tools is getting hit by an attachment or a fastener being used with the tool. 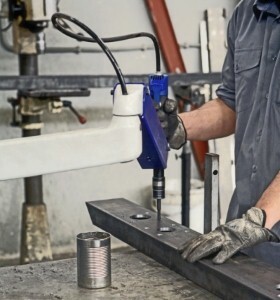 In addition to using safety clips or retainers on pneumatic tools, screens or shields are required to protect nearby workers from flying fragments around chippers, riveting guns, staplers, and air drills. Damaged tools shouldn't be used until they're repaired. Setting aside a broken tool alone isn't enough to deter other staff members who might not understand that it's dangerous. When a tool is set aside for repair or service, it needs to be clearly tagged "Do Not Use" or locked away to prevent use and possible injury. Maintaining solid footing is very important for staying safe. Many power tool injuries come from workers slipping and falling while they're using a drill, saw, or sander. Workers' feet should be firmly planted shoulder-width apart, and the floor or ground needs to be clear of debris to reduce trips and falls when using power tools.